I was excited to talk to Jason Bosch, a South African running a fruit import and trading operation in Shanghai called Origin Fruit Direct. Jason definitely met one of my main goals in the careercation—to connect with entrepreneurs of diverse backgrounds. With Jason, I learned a bunch about the fruit business, and I would never have guessed that the only fruits valuable enough to ship via airfreight are early season cherries and mangos! Jason started his career in a South African government outfit that inspected and certified all fruits and vegetables shipped out of the country, maintaining their country’s high agricultural standards. Jason inspected fruit all over South Africa and quickly learned that he was allergic to bureaucracy. To illustrate: in 1998, the agency was conducting all inspection write-ups by hand, which then required an admin to transcribe, type, and return the report for review. Jason lobbied to use a laptop, which would result in more efficient and accurate reporting. After his request had been sent up one level after another over many weeks, his request was denied. Another South African fruit exportation company, AfriFresh Group, offered him an opportunity to run the operations, sales, and marketing groups for the Far East and Middle East regions. Jason jumped at the chance. While in that role, Jason noticed an increasingly large appetite for fruit in Hong Kong and China. Sales were way up in East Asia while other international markets remained flat. Nobody understood the consumption habits and sales process in China, in spite of exponential growth there. South Africa did not have anybody “on the ground” to investigate, explain, or maximize the potential in Chinese fruit import markets. 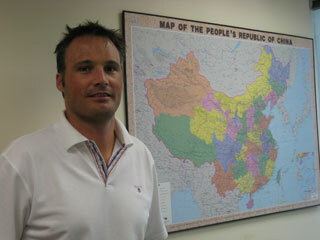 In 2008, Jason Bosch planted the seed of moving an outpost to Shanghai. He got enthusiastic support from AfriFresh to run a joint venture and opened up Origin Fruit Direct. Today, Origin Fruit Direct Asia is a leading importer and fruit trader. The agency employs six people in Shanghai, two in Chile, and one in South Africa. They import fruit not just from South Africa, but from South America, the U.S., Egypt, Australia, Mexico, and smaller countries as well. Here is some guidance from Jason on grafting the business practices of East and West. Jason learned that the confrontational, aggressive work style typical in South Africa and other Western countries doesn’t work well in Shanghai, so he had to adapt his work approach. He started by taking a more active role in becoming a respected friend, as opposed to an aloof boss or best buddy. Because of the deferential communication styles that Chinese people typically have with their employers, in order for Jason to get creative help on problems, his employees needed to find him trustworthy and approachable. Acting distant or detached from his workers kept them following orders, but didn’t result in innovation from the team. Origin Fruit Direct Asia was the first business that I had encountered on my trip that has never conducted formal employee reviews. Instead, they rely on setting goals to determine performance-based bonuses and raises. Jason also procures another active feedback loop: after the season is over, he actively asks customers what the company can do better and what they have done well. Jason receives comments for both the company and the employees who interact with the customer. Then he aggregates and passes the feedback on to the proper parties, in order to provide customer-centric insights. In spite of not having a formal review process in place, Jason has promoted many employees from within. In almost five years, he has only lost two employees, and one of those was due to illness. Since the younger staff members have seen the company flourish, they feel empowered to learn and grow into new roles. In fact, two very junior employees who started off in admin and filing have since become valuable assets to Origin Fruit, one as head of logistics and the other as a junior accountant. This tip definitely caught my attention. The nuance that struck the deepest chord with me is getting feedback from customers about how their products and team are doing. Moving forward, it would be great to leverage technology to get a pulse on how customers perceive the company’s offering and how they view employee performance. Then I’d share that feedback back with the team to highlight those employees who are going above and beyond, and to identify which clients need to be triaged with extra attention before they jump ship. Another consequence of working in a culture that has to cajole communication from subordinate employees is that Jason receives little feedback on his performance as a manager. At a corporate learning event, he was bowled over by how effectively an outside coach interviewed another executive, bringing up and exploring very important issues. It inspired Jason, and he’s thinking about who can help him in this regard. Jason used to dread holidays and vacations, fretting that things wouldn’t get done when he was gone. Upon reflection, he realized that he created this situation by not enabling the team around him. Even as a student, he was acknowledged as a talented individual performer—on the rugby pitch or in school—who struggled as a leader because he didn’t delegate enough. Jason connected the dots and realized that this tendency reflected a managing weakness at Origin Fruit. There are too few people in the company that fully know operations; consequently, there are too many potential points of failure if they lose key staff members. This jeopardy limits their growth. For this and other reasons, Jason appreciates the Entrepreneurs’ Organization. As a member, he can receive coaching around hiring senior staff. Hopefully, with a more empowered team, Jason can take a truly relaxing vacation—rather than working on his laptop while cruising on a boat during his honeymoon. This is the only foreign fruit importation company with an office in China. At first, the company considered just having a South African representative. Being in-country, not just visiting from the home office, has enabled Jason to get accurate market information, to intimately know the supply chain, and to receive feedback without physical, cultural, or language barriers. On the other hand, Jason acknowledges that to a foreigner, the Chinese culture is still very complicated and challenging. In his search for a right-hand man to whom he can delegate business operations, Jason is open to bringing a local on board. Then his team can develop even deeper relations with clients and gain a better understanding of the local market. I learned that the Chinese buy fruit with their eyes because many fruit purchases are meant as gifts designed to impress the recipient. Large, perfect-looking (non-organic) fruits are highly valued. I also learned that Jason Bosch’s favorite fruits are seedless grapes; that pesticides are quite safe; and that it can be extremely challenging for a foreigner to thrive in another country, especially from a people-management perspective. Jason’s tips reminded me that even though management styles need to be localized, some best practices, such as customer-centric feedback and employee empowerment, remain valuable regardless of a business’s culture of origin.